In an age of mass-produced plastic everything, I’m often moved by lost-art craftsmanship. When I was a child, carousels had hand-carved, hand-painted horses that went up and down on very visible mechanics to the raucous Calliope song. 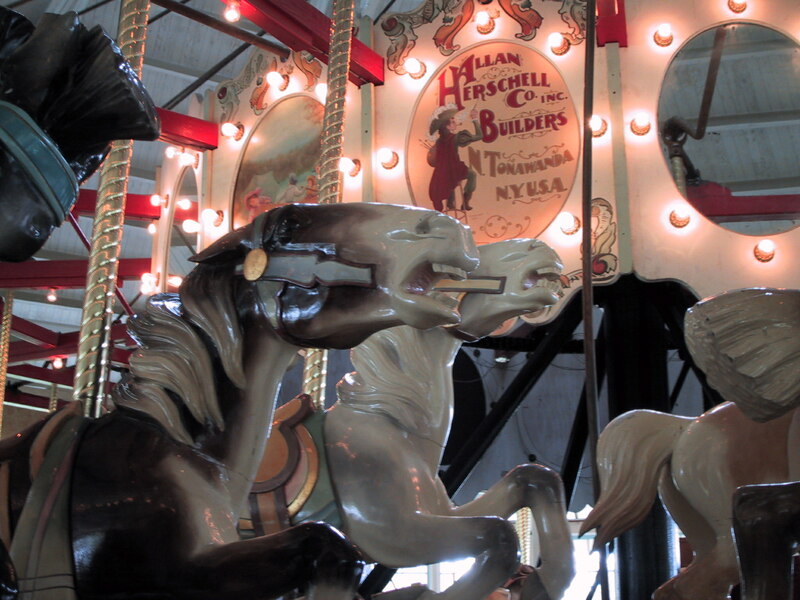 There are probably only 150 antique carousels in North America. The Binghamton area has six of those. That’s pretty incredible considering that Binghamton has a population of about .01% of North America. The entire Binghamton area grew up in the 40s, 50s and 60s with paternalistic companies like IBM and Endicott-Johnson shoes. Endicott-Johnson was famous for training immigrants. No one ever got laid off from IBM. IBM even had a country club for their employees and as an IBM child, I swam in that pool and sledded on their golf course in the winter. George F. Johnson, an Endicott-Johnson founder, actually grew up in a very poor household. As a successful entrepreneur, he bought six carousels and donated them to area parks on the condition that children never pay to ride them. When there was talk of removing or replacing these old relics, apparently one or more of my childhood classmates put up a fight. They won. These six hand-made carousels are still running every summer and they’re still free to ride. Restoration of the paint has also been undertaken. I took this picture twenty years ago before they were restored. Extra points if you know the poem from which the title of this blog is taken. As an ex-roaster who had ten different ways to make coffee at home, being weaned from excellent coffee is a zen exercise in patience and wabi-sabi. Imagine my delightful surprise at discovering a truly superb roaster in Binghamton, New York of all places. Coe not only knows how to buy coffee, but also how to roast and how to get the perfect espresso out of the machine. Mary Ann also pulls the perfect shot. Laveggio Roasteria is right in downtown Binghamton at 101 Court Street. The original spiedies were marinated cubes of leg of lamb grilled to perfection on a skewer. Sure, we’ve all had marinated meat on a skewer. The Binghamton flair, however, was that it was served with a slice of soft white Italian bread that you wrapped around the four or five cubes of meat and then pulled the stick. The remaining sandwich was the penultimate bar food. You could buy them one at a time while enjoying Genessee or Utica Club upstate New York beer. On our way south from Toronto, We stopped in Binghamton for two days. I dreamed of having those very spiedies that long hibernated in the cerebral creases of my brain. Finding authentic spiedies was a Herculean task though. They serve what they call spiedies, but they were not the spiedies of my memory. 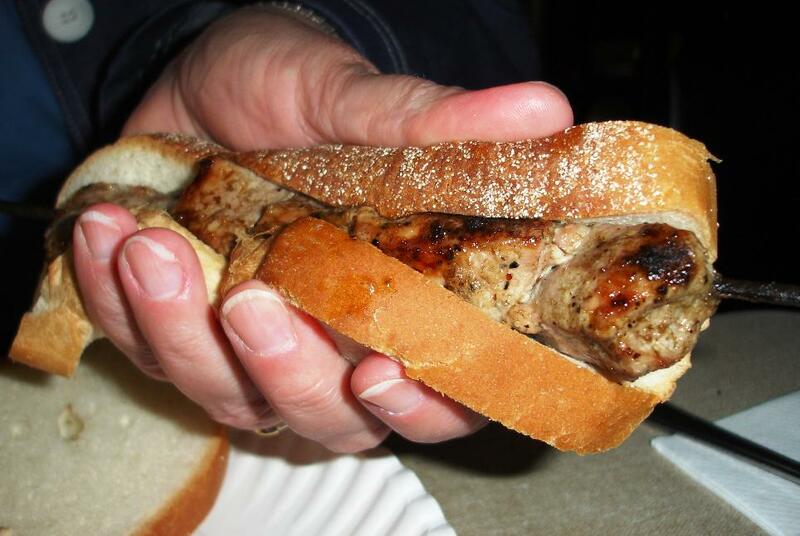 These days, Binghamton restaurants grill chicken or pork only, put it in a sub roll and call it a spiedie sandwich. That’s a submarine sandwich, not a spiedie, damn it! Evidently, since I myself left for other frontiers, spiedies have fallen out of favor with the upstate New York populace. This in no way implies that I kept an entire industry alive with my personal consumption. After much Internet searching and asking the local residents, we finally found the one remaining restaurant that still serves lamb if you ask for it: Lupo’s. They do, however, shove it in the sacrilegious submarine roll. My friend, Mick, a local television weatherman and lifetime Binghamton resident, told me a secret. When they hand you the submarine sandwich, you have to ask for Italian bread on the side. It’s the only way to get something that closely resembles the original. Spiedies are near extinction. Something must be done. It’s a call to arms! Or, maybe it’s a call to grill? Buy a loaf or two of soft Italian bread, seeded or not, but pre-sliced. Cut a spring leg of lamb into cubes about 1-1/2 inches. Pull off the grill and nest each skewer in one slice of bread. Hold the meat with the bread, pull out the skewer, and voila! Blend into a dressing. Marinate overnight. Everyone complains about their memory, but no one complains about their intelligence.